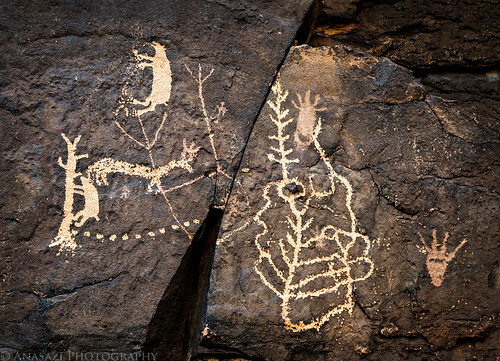 Here’s a photo from a new petroglyph panel I visited on Saturday near Montrose, Colorado. I’ve been wanting to visit the Shavano Valley Petroglyph Park for a while now, but never followed through in obtaining permission to go. Last week a got a call from my friend Greg who was planning on visiting the site so it was the perfect time for me to finally get out there. We met up at the site around sunrise (which meant it was a very early morning for us) and spent a few hours exploring and photographing the petroglyphs. This is certainly one of the better petroglyph sites I have visited in the area and the bears in this panel are very cool.